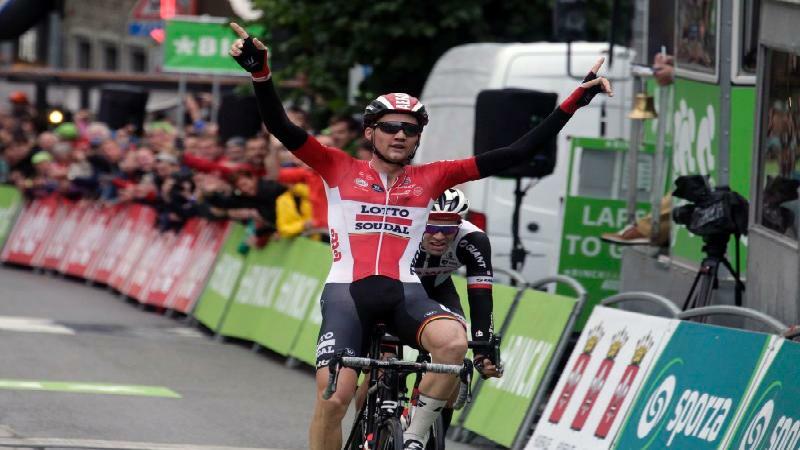 Tim Wellens has won the queen stage of the BinckBank Tour. The two-time winner of the event beat fellow attacker Tom Dumoulin in a sprint. Dumoulin takes over the leader's jersey from Lars Boom. In a tough 203.7 kilometre stage from Riemst to Houffalize the riders had to endure ten climbs. World time trial champion Tony Martin set up the day's long breakaway. The German Katusha rider was joined by five companions: Tao Geoghegan Hart (Team Sky), Dylan Van Baarle (Cannondale), Rory Sutherland (Movistar), Alexis Gougeard (AG2R-La Mondiale) and Pieter Weening (Roompot - Nederlandse Loterij). The six leaders amassed a lead of 5:30 but they were caught after the first passage at the finish in Houffalize by a small peloton, which had already lost Philippe Gilbert. Belgian champion Oliver Naesen was the first favourite to go on the attack but a counter by Tim Wellens made the most victims in the group. Attacking with the Golden Kilometre in sight, the Belgian gained nine bonification seconds in the standings. Peter Sagan swiftly followed Wellens but a flat tyre ended all hopes of a good result for the Slovak. The world champion caught his fellow riders one by one but he would never make it back to the front of the race. Wellens was then joined by Tom Dumoulin at the front of the race. Greg Van Avermaet came very close to bridging the gap, but fell a few metres short. The Olympic champion ended up in a chasing group with his Belgian compatriots Jasper Stuyven, Tiesj Benoot, Oliver Naesen and Denmark's Michael Valgren Andersen. However Wellens and Dumoulin kept riding away from them second per second. In a sprint Wellens easily beat Dumoulin for the victory. Twenty seconds later Stuyven sprinted to third. In the general classification Dumoulin takes over the lead from Lars Boom. He holds a four-second lead over Wellens going into Sunday's final stage.